Arriving in Scanno a few years after M.C. 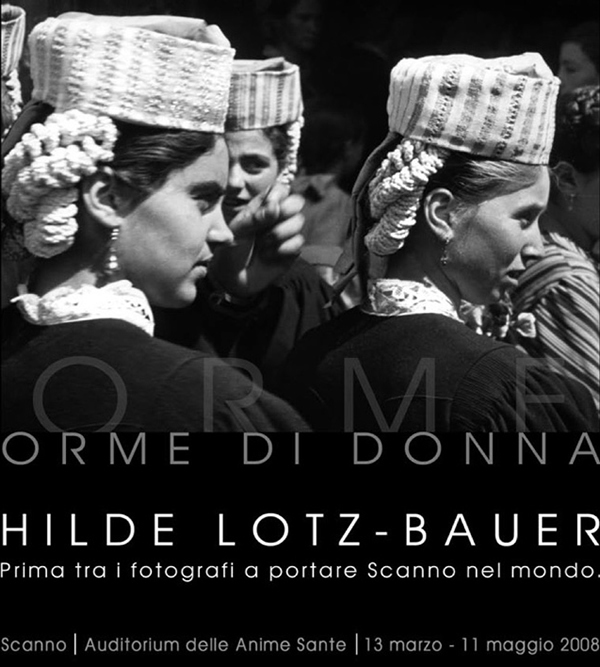 Escher and two decades before Henri Cartier-Bresson, my mother was not only ­la prima donna che scattò a Scanno [the first woman to shoot Scanno], as Italo Zannier so nicely put it in Il Sole. She captured the spirit of the people in a unique way, deploying a classical sense of composition and framing to create iconic images of people and places. Most of Hilde’s subjects are women. They are at work out of doors. She shows girls squatting on pavement kerbs, offering little heaps of snails – measured in handfuls instead of grams. Women holding basins of washing on their heads pass by laundry hung out to dry over woodpiles. Women rush through the mountains bearing huge bundles of twigs on their heads, skirts hitched up around their knees. In a town square they stir a steaming cauldron using ash leaves to dye the wool of their skirts. Nannarone Teo Pista carries water in a heavy copper conca easily balanced on her head, pausing a moment next to a little girl holding a baby, chickens scurrying around her feet. Lia Rotolo stands erect in the street balancing a huge tray with at least nine loaves of bread, watched by a group of children. A young peasant mother, her blouse neatly patched, stands next to her baby, which has a wooden crate for its crib. Sometimes the women relax, sitting on the pavements and steps of Scanno’s beautifully cobbled streets. Evelina Di Rocco sits in a sunlit doorway making lace. One haunting close-up allows us a glimpse into the eyes of Adelgise Pazzo. In a sequence of celebratory shots, the women of Scanno, amongst them Pierina Mastroggiogianni, Filomena Dallisandro, Ermellina Paletta, Enia Pizzacalva and Olga Santilli, show off their festive clothes, headdresses, silken aprons and fine jewellery, the beautifully pleated heavy wool skirts, full sleeves and tight bodices forming softly draped statuesque, classical shapes. We can share the high tension of a religious procession when a statue of the Virgin is held aloft, accompanied by priests, dignitaries and saluted by men in uniform. Hilde captures women coming out of church and young men lounging nearby, contrasting the elegant modernity of the youths with the strict traditional dress of the women. It was in Italy that my mother first became an independent professional, using her skills as a photographer and her art historian’s eye to earn a living. She spent nearly a decade travelling through Italy and Sicily recording architecture, artefacts, sculpture and drawings in commissions for art historians, lugging about a wooden Linhof 9x12 or 13x18 camera with heavy glass plates. For her own personal, more informal and creative work she used the newly-invented and superbly portable Leica, capturing people and scenes in the countryside and villages. The subjects seem unaware of the photographer's presence, as they concentrate on their tasks or chat to each other. How she achieved this anonymity is a mystery. Perhaps her small Leica camera was so unfamiliar in those days and in that small mountain village that people didn’t know they were being captured through a lens. But it was no doubt part of Hilde’s desire to present the world as it was, not coloured by her own feelings or emotions. It was only recently in 2006, around 70 years later, that we could begin to identify the individuals in these photographs, thanks to Filomena Quaglione’s extraordinary memory. I know that my mother would be deeply moved and honoured that her work has returned to the people that made it possible. Born in Munich, Bavaria, Hilde moved between countries and continents many times during her long life. A student scholarship allowed her to travel to Rome in the early 1930s. From then on Italy wove its spell and became her real home. She was only too glad to leave the Capital of the Movement (Haupstadt der Bewegung), as the Nazis called Munich. Later she realised that she had been amongst the very last to be awarded a scholarship without having to be a Nazi party member. It was in Italy that she met both her first and second partners, Bernhard Degenhart and Wolfgang Lotz, and pursued her photographic career. Hilde became familiar with the writings of Ignazio Silone, born in the Abruzzi, whose book Fontamara first struck home in the German-speaking community and was a runaway success by 1936 long before it was published in Italian. Silone’s book became the very symbol of resistance around the world, being translated into 20 languages. My mother could have read it as she travelled by train between Munich, Rome and Florence. Her vision of what she saw in the Italian villages and countryside may well have been coloured by Silone’s stories and the deep sympathy they show with movements for human liberation from dictatorial rule. Compelled by the circumstances of the war, she took refuge in Austria in 1943 with her baby son Christoph who was born in Florence. After Germany’s capitulation, she returned to a Munich devastated by the allied bombing campaign. It was Anno Zero. There her two daughters Irene and Corinna were born. In 1953 she followed her husband across the Atlantic to the United States where she brought up her family in various towns near New York City. A decade later the family crossed the seas again to settle in Rome. Hilde then lived in the centro storico for nearly 25 years. Her life seemed to come full circle when she, newly-widowed, returned to Munich in 1985. During these last years she insisted on returning to Rome and Florence time and again, defying crippling arthritis and virtual blindness. She wanted to be with her closest friends, men and women she had known for more than 50 years. She wanted also to experience again the smells, tastes, the fountains, streets, walls, pavements and buildings and equally important, the ordinary inhabitants – il popolino. Of the diverse forces and passions that drove my mother, her attachment to Italy was amongst the strongest. She had unlimited energy for her children, her husband, her friends. But Italy held a unique place in her heart. On the reverse of a tiny photo First Christmas in Rome 1933 she carefully noted the name of the landlady, Signorina Fioretti, who brought her an espresso every morning when she first stayed in the capital. In her Munich flat, 50 years later, she pinned up a photo of the medieval tower Torre dei Ramaglianti in the Borgo San Jacobo in Florence. She and her husband-to-be Wolfgang had lived there during the wartime, in a small flat at the very top of the tower lent to them by a close friend, Dr Alice von Platen Hallermund. Near the picture of the medieval tower she always kept a framed photo of an old peasant smiling in a carefree way. My mother had many sides to her personality. She was a true cosmopolitan who travelled the world, but was equally concerned with the day-to-day lives and struggles of young and old people immediately around her. She was the most loyal friend, partner and mother. She was a sportswoman who loved fencing and skiing. She was an aesthete who loved the classical and contemporary in art, music, design, fashion and all creative expression. Her photographic career was informed by her knowledge of art history and vice versa. Her deepest attachment to any country was without doubt to Italy, but it was her Italy, shaped by her experience of it as a refuge, a place where she found kindred spirits. That’s why she composed her own version of Goethe’s famous poem about his longing for Italy - Kennst du das Land wo die Zitronen blühen? She had made it her country.